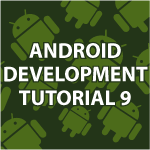 Welcome to part 9 of my Android Development tutorial. Here is the complete package for my Android Stock Quote Picker. In this tutorial I will focus on using the Android XmlPullParser for parsing an xml file. I’ll be getting data from the Yahoo Web Service just like last time. Google recommends the XmlPullParser over all others because it is fast, requires the least amount of memory and helps maintain battery life. With the video below and the code that follows you should have no problem using it in your own Android apps. All of the code is available from the link above. Your tutorials are insanely great and I love it. I wonder if you could do a realistic and detailed debugging session using DDMS and debug threads and walking through code and showing a few good tricks along the way. Thanks and keep up the good work. Yes, that’s what I am talking about, “much more complicated apps”. There are lots of beginner tutorials that implement trivial apps. More complicated apps, and better yet, more sophisticated apps will set you apart from the rest. I would appreciate it also if you did a tutorial concentrating on appearance and styling of the app. There is not much attention paid to styling, yet appearance is extremely important on a crowded android market. Thank you again for your priceless work. Hii Derek, how r u?? hope that u r fine. Awesome series brother. Can you please make a detail tutorial on multiscreen handling. I need to learn about it. can you?? Hmm nice to hear this …. i will desperately wait for it because multiscreen handling is used in every project. your tutorials are amazing, and i thank you for that. sometimes the code fails to load due to manifest problem. i hope you can tell us more on how to edit the manifest. and again thanks a lot. Thank you very much 🙂 on occasion weird errors slip in that I never thought of. For example the tip calc messes up if people use a comma in the price amount instead of a decimal. I never thought about that. Tnx, can’t wait to check out the next toturials. I’m glad you are enjoying them. Many more are coming. This is a bug. Try turning USB debugging off and then on your phone. Restarting Eclipse sometimes fixes this as well. I was trying so hard to get the program from tutorial 8 to work. I spent several hours debugging the program, trying to get it to not crash. All I needed was was the beginning of this video. Haha, oh well. I love the tutorials though. The style is very much needed for this format. Thanks for making them! thank you.this website is more important me. You’re very welcome 🙂 Thank you for checking out my website. I started with 8 and then eventually changed over to 9 to use the XMLPullParser but still just crashes on start up. I made sure I had the tag set up in the manifest file and even added the id to the TableLayout in the activity_main.xml file that someone posted in the comments of tutorial 8. I am thinking it has to do with one of the nulls i have in the code, but i am not positive. 1) needed to add the StockInfoActivity activity to the manifest file. I will keep digging…thanks for the reply! I’m sorry about the confusion. It think the problem is that I made a package for each part of this tutorial being the stock app. Some times I have to make a judgement call, but I can see how having a bunch of apps with the same name that do something in a different way would cause conclusion. It seems like the major issue based on your list of problems is that the manifest isn’t updating. That seems to happen if Eclipse Indigo isn’t used. Hi Derek, Thanks for the tutorials. They are really great. Just a quick question, what is the main advantages in using XmlPullParser vs DOM method you used in previous tutorial (Tutorial 8)? Apart from different ways of doing things, are there any efficiency considerations? Which one is faster, take more memory/overhead etc.? Thanks, keep up the good work!! You’ll probably always prefer to use the XmlPullParser because it is easier to use then say SAX and it is the least processor intensive in comparison to all the other options. It is all about ease of use and extending battery life. I think there is a problem in your code, however. XmlPullParser does not seem to take into account when the XML has just an empty closing tag (ex. ). This in turn leads to an array that is offset by the number of Texts missing. In my case, the daily low and daily high values are not filled in (http://pastebin.com/eHYQExUH). This in turn leads to xmlPullParserArray to be offset starting at . On my version of the application I have 866 for the name of the stock which of course is the Volume (or the name offset by two). I thought I did something wrong but pasting your code from this page gives me the same error. Any ideas about how to avoid this type of error? Thanks again for all your tutorials and any light that you can shed on this subjet! Thank you 🙂 Did yahoo change the way they display the data. I’ll have to take a look at it to see if something changed. When I originally made the program worked. Sorry about any confusion. I have tried the query for a couple of days now and I always have received a ‘correct’ result. I’m thinking that it is during the weekend that the XML sends empty closing tags for DaysLow and DaysHigh, which would make sense as there would be no day low or high during the weekend. So in general, I think that your code works perfect, except for maybe the weekend. I will let you know if this is really the case when I retest this weekend. In any event, thanks again! Thank you for making me aware of that 🙂 I’m sorry about the error. I tried to modify our stockapp. I tried different approaches. But it didn’t work out for me. If the stock doesn’t exists, I want an alertbox to show. I cover Android dialog boxes in this tutorial. I’ll go back and cover it in the future, but Google recommends that the XmlPullParser be used because of a couple reasons, but the big one is that it isn’t as much a drain on the battery which is very important. When I try to get a quote, the ‘Company Name’ is displayed near the top of the page, then, about 2/3 of the way down, the ‘Year Low’ and ‘Year High’ are displayed, but that is all. None of the rest of the information is displayed. When I looked in LogCat, it shows ‘skipped frames’ (see below). Is this what is causing my display problems? If so, how do I fix it? 12-22 07:19:26.669: D/gralloc_goldfish(1200): Emulator without GPU emulation detected. 12-22 07:19:50.079: I/Choreographer(1200): Skipped 49 frames! The application may be doing too much work on its main thread. 12-22 07:33:02.538: I/Choreographer(1200): Skipped 39 frames! The application may be doing too much work on its main thread. 12-22 07:33:14.139: I/Choreographer(1200): Skipped 44 frames! The application may be doing too much work on its main thread. The emulator doesn’t seem to be working right. In this tutorial I show how to install all the new Android development tools. I followed everything from this stock app, rechecked your code over and over and redid the tutorials, first one that would not work for me, can I zip the file to you and you tell me where my problem is, so many hours trying to make it work with no avail. Maybe something changed on Yahoos end? I’ll have to look into it. All the information presented here though should allow for a fix in the code. Probably a tag name changed I’m guessing. Sorry about that. Hi Derek we are in a full time Android college class here at the international English academy in Aarhus, Denmark. Two other of my classmates just completed this one too, and had the same errors, not able to make the stockquote app work. Same coding as yours, so something is rotten in Denmark. HaHa. Do you accept zip files to look at, maybe there is a problem with yahoo like you said. Hi Tom, It seems like Yahoo may be blocked in certain places because I’ve had people tell me that it didn’t work at work and then it did work from home? I’ll look into whether the feed from yahoo has changed as well. If Yahoo changes their tags that will break the app. Sorry about that. Hey Derrick! I’ve been hopping all over this site and getting a breadth of information. I’ve come to a few conclusions, #1. I have no idea how to network, is that apart of the more advanced java language? #2. I need to practice more at classes and methods. #3. The bottom finally fell out. I knew it was going to happen, just didn’t think it would be this soon. For a little guidance, do you suggest studying more of just java? Or continue with the Android Development and picking up things along the way? To let you know what my end goal is, to develope apps so I have a overall feel for designing and connectivity. Anyway thank you for any advise! Stick with it and you’ll get it. Try watching the first 2 videos in my object oriented design tutorials. They should help explain the thinking process. Always feel free to try Android or anything else. The number one goal is to keep it fun and exciting.